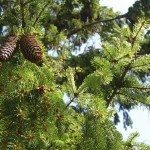 I purchased 5 Alberta spruce bushes for Christmas decorations. Can I put them outside in their original pots for the winter until they can be planted? I live in northern NJ. I would not put them outside right now, as they are not in dormancy and the cold will kill them. But an attached garage would be ok. Just set up a few fluorescent lights near them to give them enough light to make it until early spring. As soon as you have any kind of spring like weather, you can move them back out.